This has been a rich month in Watermark Kids as we’ve spent time talking with the kids about “righteousness”. Every godly character trait we study in our curriculum presents a unique opportunity for us to point to the gospel of Jesus, but some traits are much more direct. “Righteousness” is one of those traits. None of us are righteous. None of us can earn righteousness. Not through good works. Not through keeping all the rules. Not even by going to church! It’s only through faith in God who saves sinners (see Romans 4:5) that any of us can be made righteous. This raises the question for all of us as parents: How do we parent our kids towards a faith that saves? As Christian parents, this should be the driving goal of our parenting, to point our kids towards a faith in God who saves them from the slavery, pain and penalty of sin. This is not a simple task, but I want to take time to offer four practical encouragements in sharing the gospel with your children. Perhaps this goes without saying, but we must know as parents that salvation is a work of God alone. Ephesians 2 tells us that we were born “dead in our trespasses and sins”. You and I don’t have resurrection powers. Only God can breathe life into dead bones (Ezekiel 37:4-5). Parents do not save kids. Jesus does. When Jairus realized his daughter was dying in Mark 5, he didn’t stay by her side and try to convince her not to be sick. He went and sought Jesus, fell at His feet and begged him to heal his daughter. Follow his example. Not sure what to pray? Here’s 7 Scripture texts to pray for your kids from our friends at “Desiring God” that I have used and been blessed by. As we pray, God simply asks us to be faithful to be used by Him to declare the good news of the gospel to our kids. As you do so, remember this: the gospel is not a series of bullet points or steps in an instruction manual. The gospel is a story . . . the greatest story ever told. Tell your children the stories of the Bible and show them how they all point to THE STORY of the gospel. Sally Lloyd-Jones accomplishes this brilliantly in The Jesus Storybook Bible, a resource I go back to often with my kids even as they get older. The verses and principles in the “Roman’s Road” are wonderful. Memorize them. Have your kids memorize them and use them to reinforce the lessons they learn through stories. Practically speaking, a mistake that parents often make when talking about the gospel with their kids is found in the questions they ask. So often, we may share the story of the gospel with them and then ask them questions like “Do you believe that Jesus is the Son of God? Do you believe that He died for our sins and rose again? Do you want to trust him to save you from your sins and give you eternal life?” These are simple questions that a child, with a great desire to please their parents can easily answer yes to without having a true understanding of the gospel. Instead of “yes/no” questions, ask open-ended questions and have your kids explain the gospel to you. The best way to tell if anyone comprehends something is to have them teach it to someone else. Ask questions of your kids where they must articulate their understanding of the gospel in their own words. One other note here: Don’t trust buzz words! There are a lot of church buzz words that kids hear and repeat back. Examples might be, “I want to get saved” or “I want to ask Jesus into my heart”. The best way to respond to a child who uses one of these phrases is to ask them what they mean by that and let that launch you into a series of open-ended questions. This leads to the final tip. Every Christian parent longs for their child to become a Christian. We begin praying for them as babies that the Lord would allow them to come to know Him and place their faith in Him at an early age. Sometimes in our longing for them to understand the gospel, we are tempted to jump at any sign of a saving faith in their lives. Art Murphy in his book The Faith of a Child has a helpful breakdown of the Stages of Spiritual Development. His breakdown provides simple categories for parents as they try to discern what is happening in the hearts of their children. The admonition is this: patiently shepherd your children through these stages and resist the temptation to convince your child to make a decision they are not yet ready to make. Trust the Lord to reveal Himself to your children in His time. D.L. Moody, the famous evangelist of the 19th century, once responded to a critic of his style of evangelism by saying, “Well, I like my way of doing it better than your way of not doing it.” No parent will do this perfectly, but don’t let that paralyze you from doing it or convince you to wait until the “professionals” can do it at church. Do something, anything to tell your kids the best news the universe has ever heard and then let God do what only He can do in their hearts. 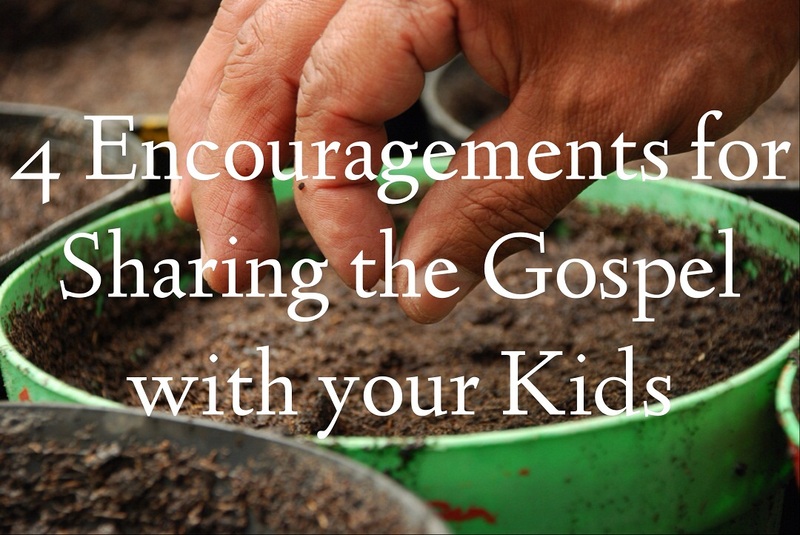 The post 4 Encouragements for Sharing the Gospel with Your Kids appeared first on Watermark Community Church Blog.